Have you seen that google ad at the side of your screen? “Magic Steps to Flat Tummy”? I have a hard time believing in short cuts to well balanced health. Very often when we do some strange, extreme fad we pay the price down the road thus the term yo-yo diet. Something that I have been experimenting with is increasing the amount of raw veggies that I’m incorporating into my diet. I’ll tell you what is magic – the phyto nutrients that veggies contain! Veggies with a hard focus on greens (radicchio, endive, rocket, arugula etc etc) supply all sorts of nutrients and are high in fiber and water to keep the colon happy and healthy. For me that has lead to a noticeably flatter tummy! You can start by getting creative with your salads! 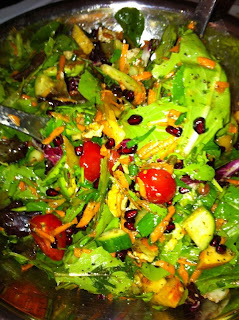 On top of the usual bed of greens punch up the flavour quotient by adding berries or chopped apple. You can go in another direction with pungent veggies like onions, radishes or raw shredded beets. Top it off with a good quality protein – nuts, seeds or cheese. The “icing on the cake” is a good quality oil – olive or grape seed – and some lemon juice or a flavoured vinegar and a handful of fresh herbs. Make sure that it’s balanced with all the components – protein, fat and carbohydrates – to satiate your appetite and hold you until your next meal.